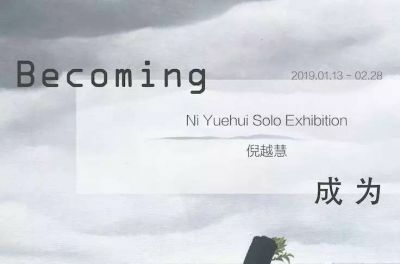 ArtCN is delighted to start the New Year with the solo exhibition of emerging artist Ni Yuehui. Unfolding a selection of her oil paintings on canvas and oil pastels on paper, this marks the artist's first solo exhibition in the gallery. We live in a time when images are massively produced as much as they are instantly vanished. Our smart phones and computers, the cyborg of our digitalized personna, extend our senses of reality to an augmented reality, the reality embraced by digital information. Between the tangible world we live and the algorithm entrusted reality, just where do our real emotions stand? And what is real? Amongst such quests, is there a key that would unlock the link between an image and the representation of the image? What are we looking at in Ni Yuehui’s paintings? She has painted a cactus growing on a stoney ground, the roots of an ancient tree covered by jagged bark and she has painted soft-tissued marine animals and plants wiggling in invisible underwater currents. She is both a still life painter depicting objects with meticulous details and an image maker painting the sky in different shades of grey and tree tops bathed in sunlight. The atmosphere in her paintings vacillates from classical Flemish genre painting to surrealism in the style of René Magritte. Between observation of her familiar surroundings and imagination from literature, music and films, Ni’s paintings move freely. Her motives are not restricted to nature nor to city. She believes what W.S.Maugham said about nature: Nature and the beauty of nature are dull and meaningless, unless they are enchanted by art. Art gives meaning to things. In this way, Ni Yuehui is a young woman taking art as her way to enchant the world and her life. As most of the Chinese youth born in the 1980s, Ni didn’t have to experience the material shortage that her parent’s generation went through. She grew up in a family with loving parents who have encouraged her dream to pursue art. Already at the age of 5 when she took up a brush and made her first painting, she knew that she wanted to be an artist. All those things that she painted on her canvas: the endurance of the cactus, the vulnerability of sea plants, the sky that keeps on changing color and forms… are all meditations of her life. Her daily practice in her studio is the process of getting in tune with herself. She struggles to find the balance of a painting between color, shade and structure, sometimes it is technical, and sometimes it is purely intuitional. Her uncertainty as well as her confidence, are all embodied in her paintings presented here in this exhibition. If painting is the world on a canvas stretched by a frame, the world outside the frame is much bigger and tempting. What is she going to become, Ni Yuehui, as a young woman and as a young artist? We may find some clues here in her first solo exhibition entitled Becoming.